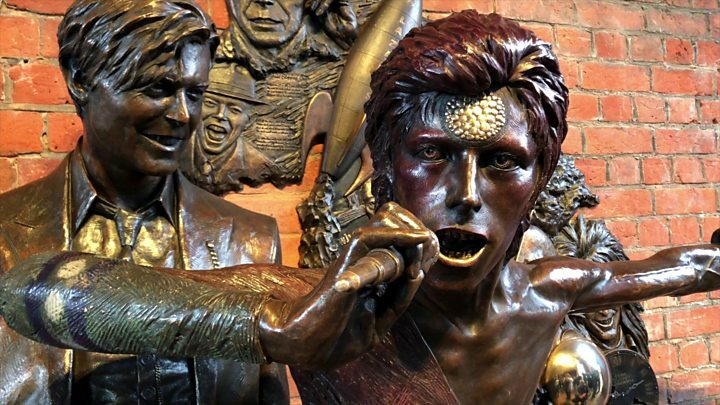 A statue of David Bowie has been unveiled in the town where he debuted Ziggy Stardust. The bronze sculpture, entitled Earthly Messenger, can be found in Aylesbury's Market Square. It features a likeness of Bowie in 2002 regarding a selection of his alter egos down the years, with Ziggy at the front. Speakers mounted above the life-size piece will play a Bowie song every hour. Singer-songwriter Howard Jones unveiled the piece and called it a "result for Aylesbury". Money to create the work was raised through grants and a £100,000 crowdfunding appeal by music promoter David Stopps. "The reaction to the statue has been so positive," Mr Stopps said. "When you get something like this people either love it or hate it. If people say 'I hate it' or 'I absolutely love it' then you know it's real art. That's the definition of art." The unveiling comes after Mr Stopps launched a petition to rename Aylesbury "Aylesbowie" in honour of the artist's "strong connection" to the Buckinghamshire town. Bowie first performed as his Stardust persona and debuted two albums at gigs at the Friars music venue in the early 1970s. The statue was designed by sculptor Andrew Sinclair, who used the mask taken from Bowie's face during the filming of The Man Who Fell to Earth to create the likeness. Rob Stringer, CEO of Sony Music, described it as "beautiful". "I thought it would be one figurine and it's actually a complete compendium of his life," he said. "To work with him on the last two records was very emotional but I got to work with somebody who, when I was growing up in Aylesbury in the 70s, was the pop culture legend."